Contact 1-800-450-5319 or fill out the form for a FREE quote and more info on auto transport to Croatia through A1 Overseas International! The long overseas travel to another country requires patience, experience and technicians. So, when it comes to international vehicle shipping, the requirements become more detailed and demanding. This is why it is imperative that professionals are called to assist with an overseas transport. They have everything they need to conduct a secure shipping process. It is very important that as the person shipping the vehicle, the Embassy of the Republic of Croatia is contacted months in advance. They will inform you of the latest auto import and export policies for the country. 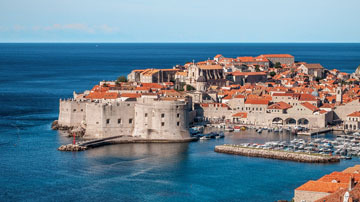 It will take some time to prepare for the transport and you will need to be knowledgeable of what is required for the vehicle to legally enter Croatia. Of course, it greatly depends on the company you go through for the automobile’s shipping process. Nevertheless, most international auto transport/international car transport companies will have certain services that are similar in nature. The services you choose should be the ones you feel most secure about. It also depends on your budget and the type of vehicle you are having shipped over to Croatia. Don’t be afraid to spend a little extra to make the process more convenient. For instance, door to door transport is very nice to take advantage of when possible. Insurance coverage is mandatory for all professional auto shipping companies. They carry this insurance to further protect the vehicles in their care. A vehicle will NOT be covered by their regular insurance policy while in the care of transport specialists. Call 1-800-450-5319 or submit the form for more information and a FREE price quote on boat, motorcycle and car shipping!